go to the Exploration Expo , which will take place at Centennial Park on Saturday, March 26, 2016. From 11:00 a.m.-5:00 p.m., you can watch chemistry reactions, launch a stomp rocket, meet real & unusual animals, touch an actual brain, build strands of DNA & see how mutations occur, construct something fun out of LEGOS or Tinker Toys, and more. There are 100+ interactive exhibits in the five Expo zones–Discover, Invent, Encounter, Thrive and Innovator’s Playground. It’s free to attend the Exploration Expo. Decatur’s Touch-A-Truck event will take place in the Callaway Building Parking Lot from 10:00 a.m.-1:00 p.m. During the free event, kids can explore all manner of vehicles on wheels–fire trucks, dump trucks, tractors, police cars, motorcycles, bicycles, & more. The Callaway Building Parking Lot is at 120 West Trinity Place, Decatur. Free parking will be available in the DeKalb County parking deck. Rain date: April 25, 2016. The Northeast Cobb Community Egg Drop will take place at Sprayberry High School on March 26, 2016. The festivities start at 10:00 a.m. & last until 5:00 p.m., and there’ll be candy, pictures with the Easter Bunny, entertainment by LEW-E’s Comedy Circus, & more. Cobb County’s largest Easter egg hunt, Eggstravaganza Under the Stars , will take place on Saturday, March 26, 2016, at Al Bishop Softball Complex in Marietta. The egg hunts will take place in the evening. 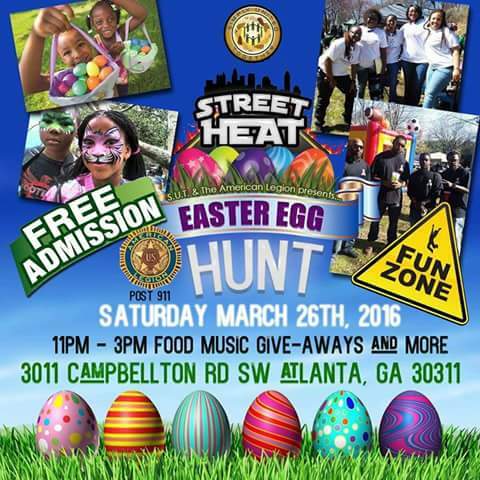 There’ll be five egg hunts, children’s art activities, inflatables, a hula-hoop contest, live entertainment, & more. Admission is free to the hunt, but there may be additional charges for some activities. Gates open at 6:00 p.m. Though they’re using glow-in-the-dark eggs, you’ll want to bring a flashlight to help you out. On Saturday, March 26, the Annual Easter Egg Hunt and Dog Parade will take place at Lake Avondale, 59 Lakeshore Drive. The festivities start at 10:00 a.m. with egg hunts for kids age 10 & under, followed by the Dog Parade at 10:30 a.m.
engaging, and let me tell you, you’ve hit the nail in the head. The thing is something which too few people are speaking intelligently about.